How did mammals develop hearing? The presence of hair might be the most obvious feature of humans and other mammals from reptilian ancestors, however, a less obvious, but arguably the more important difference is the presence of our complex, highly sensitive ears. Published in the Proceedings of the Royal Society of London a new international study by researchers from the University of New England (UNE) and University of Queensland challenges long-held ideas about just how mammals developed super-sensitive hearing. “What is clear is that over tens of millions of years – bones that once formed part of the reptilian jaw were greatly downsized, repositioned and repurposed to help conduct sound more effectively to the inner ear in mammals,” co-author and director of UNE’s Function, Evolution and Anatomy Research (FEAR) lab, Associate Professor Stephen Wroe. For further information, contact A/Prof Stephen Wroe on +61 2 6773 3261 or swroe@une.edu.au. 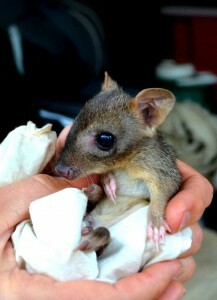 Caption for mammal image: A study used marsupials, such as this rat kangaroo, to challenge current ideas about how mammals evolved stronger hearing than reptiles. Credit: Stephanie Hing.